Just found this wonderful Pet Blogger Challenge. 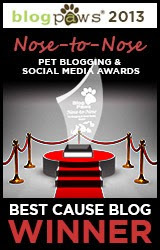 The challenge is to answer various questions about your blog. 2. What was your original purpose for starting a blog? 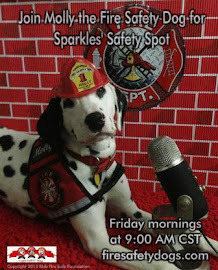 Sparkles the Fire Safety Dog's Blog started out as a way to share the adventures of Sparkles the Fire Safety Dog and share fire safety tips, helping keep children and their caregivers fire safe. 3. Is your current purpose the same? Yes. If so, how do you feel you've met your goals? There are so many children to reach. Everytime that I read of a fire related death, it makes me want to work that much harder. 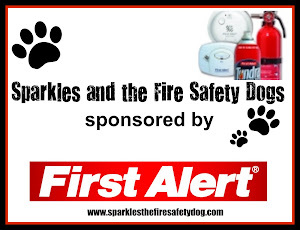 Since we started this blog, we have helped save the lives of 7 children and 2adults. 4. Do you blog on a schedule or as the spirit moves you? 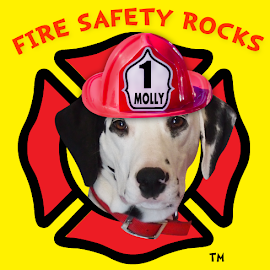 Since the fire safety dogs and I are out on the road alot, I blog as time permits. 6. What do you like most about blogging in general, and your blog in particular (bragging is good!)? 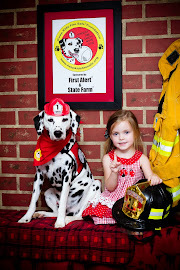 This blog helps us share the fire safety message in unique fun ways, and also helps other educators and firefighters, as we provide resources for them as well. 7. What do you like least? Not having enough time to blog as much as I would like to. 8. How do you see your blog changing/growing in 2011? Since I have added a new puppy to the mix, I hope to follow his adventures as well. Since Sparkles passed away, the new dog, Siren, will be blogging.